A group of 19 including wives of 4 GYRRs and 2 husbands, took part in the Porto trip organised by Nicos and Ian Tooley. 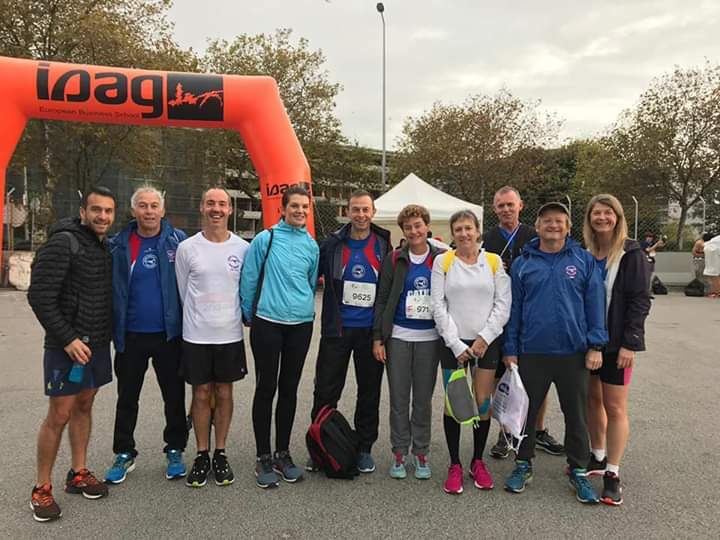 The aim was to either run the unusual distance of 15k or the Marathon and to all have a really good time socialising and enjoying the local culture including the port tasting and the local menu. A fantastic time was had by all!! Phil Q, Andrew D and Anna C committed to the Marathon and the remaining GYRR including coach Andrew B and Nicki, Nigel, Ian and Cathy, Jo and Sid A, Nicos all ran the 15k. Unfortunately, the weather wasn't on our side at all and it was a generally soggy miserable day but lots of clear plastic sheeting was made available for runners before and after racing. The 15k and marathon were started at the same place and time with the Marathon crossing the famous Pont Luis bridge built by Gustuv Eiffel twice having run along the Douro River on both sides of the Ribeira (riverside) and enduring distances of uneven wet and slippery cobbles. Mark P, Vicky and Pandora were unable to run on the day but made up for missing the race by being outstanding supporters and photographers of all the GYRRs and also Mark W and Heidi. Andrew D and Anna C ran amazingly in difficult conditions and gained their Good for Age for London Marathon in 2020. Phil Q ran outstandingly having completed the Abingdon marathon only 2 weeks before, gaining his GFA for London 2020. Andrew B led the 15k pack home in a great time closely followed by Nicki, Ian, Jo, Nicos, Sid, Nigel and Cathy. And for 15k Andrew B 1.05.24, Nicki 1.14.40, Ian 1.14.42, Jo 1.15.05, Nicos 1.20.10, Sid 1.21.25, Nigel 1.26.46 and Cathy 1.26.59.